"There are just 6 million Russians left on the Siberian side of the border with China. Ninety million Chinese, backed by a voracious economy, live on the other side. China's influence in Russia's far east is growing rapidly and Siberia has become the raw material supplier to Beijing's economic miracle. [...] Could an alliance develop in this region between two powerful countries that would finally put an end to American dominance of the world? One of the two has the raw materials that the other one needs so urgently. Or will the land of Vladimir Putin become a bulwark against an increasingly self-confident China, and thus become the natural partner of the West? Or will neither of these scenarios come to pass, when overpopulated China simply swallows up depopulated Siberia? [...] Forgotten by the Kremlin? Siberia, which covers three-quarters of the landmass of Russia, is home to only a quarter of the country's population: 38 million people. 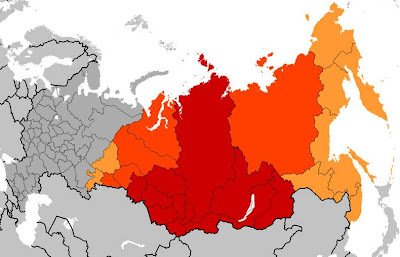 This is the equivalent of the population of Poland, except that Siberia is 40 times the size. It is a situation that many fear could once again spark the eternal rivalry between Russia and China, a rivalry that last produced military clashes in the 1960s." Surely the Russians can figure out how to profitize their incredible advantages as an asset-rich Eurasian bridgeway to Asia?